The Community Health Worker Health Disparities Initiative has evolved over the years since its inception in 1994. Starting as a pilot project in Washington, DC, to raise awareness about heart disease risk factors in Hispanic/Latino communities, the Initiative has gone through a multicultural expansion in the United States to reach African American, American Indian, Alaska Native, and Filipino American communities, as well as low-resource communities in Argentina, Chile, Guatemala, and Mexico. This expansion has been possible through partnerships with numerous national and community-based organizations to establish a strong network to implement the NHLBI’s community-based heart health programs in underserved and minority communities. To ensure proper cultural and linguistic adaptation of materials and implementation strategies, the NHLBI has used a variety of formative research methods, including focus groups, interviews with community leaders and community residents, group discussions with key community partners, environmental scans, literature reviews, and strategy development workshops with stakeholders. Feedback from community health workers (CHWs) and community members has confirmed that the NHLBI’s heart health resources are culturally and linguistically relevant and flexible enough to address the needs of the minority and underserved communities experiencing the greatest disparities in heart disease. Most recently, the Community Health Worker Health Disparities Initiative has engaged CHWs and other community health educators in the development of a new asthma education program to help parents learn how to control their children’s asthma in Hispanic/Latino communities. The new “A Breath of Life: Asthma Control for My Child” (Respirar es vida: El control del asma en nuestros niños) program will include a manual, picture cards, and a 15-minute video recorded in Spanish with English and Spanish subtitles. The new asthma education materials will be culturally appropriate, easy to read, and available in both English and Spanish. The manual and picture cards are slated for release in 2014. In 2012, the NHLBI funded nine strategic champions to implement multifaceted, innovative, sustainable strategies with strong community and academic partnerships to address heart health disparities in underserved and minority communities. Champions were tasked to increase CHWs capacity to implement NHLBIs heart health curricula, expand heart health education and support in their communities. The NHLBI began an ambitious project to adapt and expand the first edition of Your Heart, Your Life manual for other at-risk minority communities. Extensive formative research (e.g., environmental scans/literature search, background reports, strategy development workshops, focus groups, and pilot testing) was conducted to ensure that the manuals were culturally and linguistically appropriate for each audience. 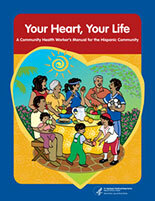 They are written for, and include input from, CHWs and other community health educators. They focus on increasing knowledge and on changing behavior. They mirror the cultures of the communities for which they are written. They use the same evaluation methods. They can be used by other health care workers and health educators. 2003: Honoring the Gift of Heart Health manuals for American Indians and Alaska Natives is released (revised 2006). 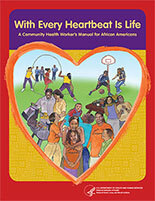 2007: With Every Heartbeat Is Life manual and picture card flip chart for African Americans is released. 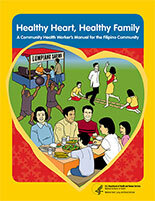 2008: Healthy Heart, Healthy Family manual and picture card flip chart for the Filipino American community is released. The manual includes handouts translated into Tagalog. 2008: The expanded second edition of Your Heart, Your Life manual for the Hispanic/Latino community, which included two new sessions on diabetes and program evaluation, is released. In 2001, the NHLBI awarded funding for 12 Enhanced Dissemination and Utilization Centers (EDUCs) — the first six started their projects in 2001 and the remaining six started in 2002 to implement heart health projects in areas that fell within the top 15th percentile for coronary heart disease and/or stroke mortality. The purpose of the EDUCs was to conduct performance-based education projects to prevent and control cardiovascular disease (CVD) and promote heart healthy behavior in high-risk communities. The EDUCs implemented various strategies, such as CHW-, physician-, and faith-based models. In 2005, the NHLBI conducted a strategy development workshop called the “Pearls of Wisdom.” The workshop’s main objective was to obtain input from attendees that would lay the groundwork for developing culturally appropriate heart health education materials for the Filipino American and Vietnamese communities. The diverse group of 29 attendees from across the United States included representatives who develop and implement outreach to the Filipino American and Vietnamese communities and/or the Asian and Pacific Islander communities more broadly. Participants represented nonprofit organizations, academic institutions, and health care provider organizations, as well as community advocates and community health educators. Many participants, including those from New York University’s Center for the Study of Asian American Health, Kokua Kalihi Valley Health Center, and Kalihi-Palama Health Center, have continued to collaborate with the NHLBI in the development of a CHW manual for the Filipino American community and a set of easy-to-read educational booklets for the Vietnamese community. In 2007, to build on the extensive Salud para su Corazón (SPSC) experience over the past decade, the NHLBI and the Health Resources and Services Administration (HRSA) partnered to establish a training center at Gateway Community Health Center (GCHC) in Laredo, Texas. Gateway pioneered an innovative training center using SPSC implementation strategies, the Your Heart, Your Life manual, and supporting materials. They developed a practice model that features promotores as extenders of care in a health care setting; promotores act as the link between patients and providers. The training center established two networks, one each in south Texas and central Florida, to train promotores to implement and evaluate community heart health education courses using the Your Heart, Your Life manual. From 2007-2010, the NHLBI and the Pan American Health Organization (PAHO) implemented three projects to kick off their joint partnership to promote heart health in the Americas. The partnership supported three CHW projects in low-resource communities in Mar del Plata, Argentina; Chillán Viejo, Chile, and Mixco, Guatemala. The projects adapted, implemented, and evaluated the Your Heart, Your Life manual and carried out community education and outreach strategies. The partnership spawned international interest among selected UnitedHealth and NHLBI Collaborating Centers of Excellence in using the CHW model to deliver heart health education. The NHLBI partnered with HRSA and the Indian Health Service (IHS) to select 25 sites across the United States to implement all four curricula (African American, American Indian/Alaska Native, Filipino American, and Hispanic/Latino) between 2007 and 2010. HRSA implemented projects in collaboration with two African American, two Filipino American, and eight Hispanic/Latino Federally Qualified Health Centers along the U.S.-Mexico border and in Florida, Georgia, Hawaii, and Missouri. IHS implemented CHW projects in nine tribal communities across the United States. The NHLBI’s partnership with the Department of Housing and Urban Development was initiated in 2007 and has been instrumental in addressing heart health disparities among African Americans in public housing communities. Since 2007, the number of participating housing authorities has grown from 7 to 32. Starting in 1994, the NHLBI worked with an alliance of community members, organizations, and health professionals to raise awareness about heart health in Hispanic/Latino communities in and around Washington, DC. The resulting Salud para su Corazón pilot program used educational materials in Spanish and English, charlas (informal group discussions), and a television and radio campaign to engage their community. In partnership with the Hispanic/Latino community, the first edition of the heart health manual, Your Heart, Your Life: A Lay Health Educator’s Manual (also available in Spanish as Su Corazón, Su Vida) and its companion picture card flip chart was developed. The manual, which was based on evidence-based clinical practice guidelines for preventing and managing risk factors for heart disease, taught strategies for making heart healthy decisions. The NHLBI and partner groups trained CHWs to organize community events, as well as group and individual education sessions related to heart health. The positive feedback from the pilot program formed the basis for a national rollout. The NHLBI expanded Salud para su Corazón to health care and community settings across the country. Through strong partnerships with the National Council of La Raza, HRSA, the University of North Texas, the Pan American Health Organization (PAHO), and other organizations, Salud para su Corazón has grown into a heart health program that currently reaches many Hispanic/Latino communities nationwide and internationally. Concurrently, as part of the NHLBI’s commitment to reducing health disparities among minority communities, the Institute developed a background report, Building Healthy Hearts for American Indians and Alaska Natives (AI/AN): A Background Report, which provided a comprehensive overview of cardiovascular disease and an assessment of “best” practices for implementing outreach and education activities in the AI/AN communities.1 The background report served as a blueprint for the development of future NHLBI American Indian/Alaska Native outreach efforts.